Housing prices have been growing less and less affordable across the U.S., and no city is a more fitting poster child for that trend than San Francisco. 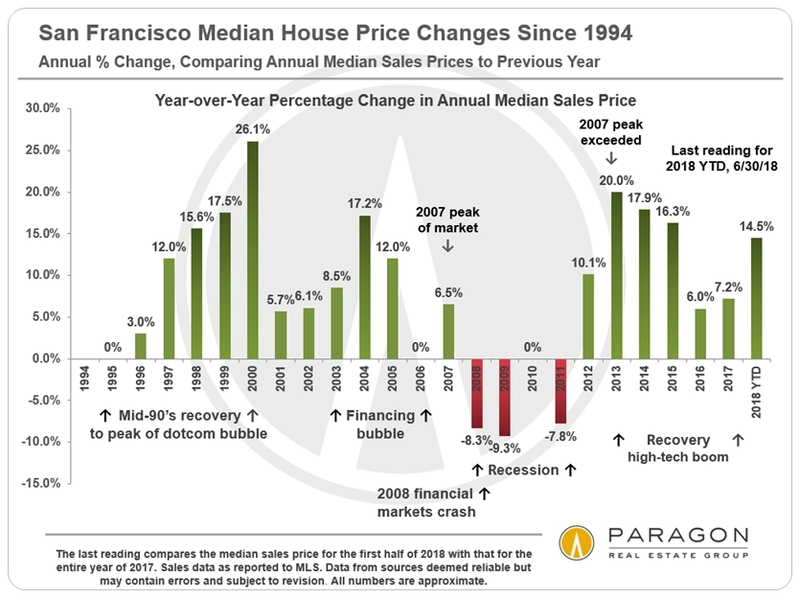 Paragon Real Estate, a San Francisco real estate company, examined the local multiple listing service and calculated that the median housing price in the city has risen $205,000 since the end of 2017, the highest six-month gain in at least a quarter century. Paragon said that a surge in both the asking prices for homes and the bids being placed by buyers, coupled with a multi-year decline in the number of homes listed for sale, have contributed to the surge in prices. Housing activists in the Bay Area have grown more vocal in calling for more available housing in the region. On a percentage basis, the median home price in San Francisco rose 14.5% over the past year to $1.6 million. That’s more than double the 7.2% rise in 2017, but not as high as the 26.1% rise in housing prices in 2000, during the peak of the dot-com bubble. It’s also below the 20% rise in 2007, just before the housing market crashed. Homebuyers who can’t afford such inflationary housing prices might consider buying a condo. The median price for San Francisco condos rose by $71,000 in the first half of 2018, a comparative bargain. San Francisco may offer an extreme example of rising home prices, but it also reflects a broader trend in the U.S. The average home price in U.S. stands at around $260,000, after having risen for the past six years, Paragon said. There are signs that the affordable-housing problems that many residents in San Francisco struggle with are recurring in other cities, albeit at a smaller scale. Home prices across the U.S. are by some measures at their least affordable levels since the financial crisis. In May, U.S. housing prices rose 7.1% year-over-year, CoreLogic said. A separate survey published this week of property-market analysts showed that they expect prices in 20 of the largest cities to rise another 5.7% this year, followed by a 4.3% rise in 2019 and a 3.6% rise in 2020. Those increases are equal to about double the current inflation rate.